The Brownsville Airport is the closest airport to South Padre Island, Texas. Located only 25 miles by car inland, the Brownsville Airport is a short drive. Continental Airlines flies into Brownsville 800-525-0280. The Rio Transit can take you from the airport to Port Isabel for only $2. Then once in Port Isabel, you can transfer to The Wave and continue onto anywhere on the island for free. The Harlingen airport is a much larger airport than the Brownsville Airport. Harlingen Airport is only 45 minutes from South Padre Island. Continental Airlines flies into HRL 800-525-0280, as well as Southwest Airlines 800-435-9792. Harlingen Airport now has the South Padre Shuttle which only costs $20 to get from the airport to South Padre Island. When you are ready to leave the island, it will also pick you up and take you back to Harlingen airport for only $20. See more information below about the South Padre Shuttle. McAllen International Airport is approximately 1 1/2 hours by car from South Padre Island. American Airlines 800-433-7300 flies into MFE, as well as Continental 800-525-0280. The Wave is the local bus that runs up and down the main strip of South Padre Island, Texas. The Wave is a free bus, and runs every 20-30 minutes. You can stand anywhere in town and and wait for The Wave to pass and jump on. Then simply request a stop and get off where necessary! The Wave is a great way to get around the island for very cheap, free in fact. It runs 7am - 9pm everyday, and will even take you across the bridge. The Valley Metro shuttle will take you all over the Rio Grande Valley. The shuttle only costs $2, and meets up with The SPI Metro in Port Isablel. 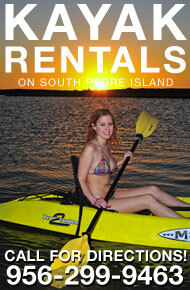 This enables you to get from South Padre Island to the rest of the Rio Grande Valley for very inexpensive. The South Padre Shuttle is not meant to be confused with The Wave. The South Padre Shuttle simple runs from Harlingen Airport to South Padre Island. It costs $25 to travel One-way or $40 Round trip between the island and the airport, and you can make reservations for it to pick you up in advance.